Good health, and joy at peak. We’ve space, and room to quest. Of those, make greatest care. So have the best New Year. * “long may your chimney smoke” - an old Scottish New Year greeting given with the symbolic gift of a lump of coal. With the gift of a birch junk, the greeting could become popular in NL. The loud and intemperate knocking on the front door didn’t just announce Uncle Gnarley’s arrival. It was a sure sign that Nav would have no peace this Christmas. Suddenly, broken Christmas lights and spouse’s irksome claims regarding Nav’s diminishing utility were forgotten amidst an overcharged sense of anticipation, one that the old man instantly inspired. Nav had not felt so happy since Gnarley visited a couple of years ago on his way to the Charbonneau Commission Hearings in Quebec. “My god, man, I thought you were going to leave me out here the whole bloody winter.” Gnarley‘s first words exploded with the gale force of a Wreckhouse wind. He and his single worn suitcase soon filled the foyer, along with myriad ornaments. Spouse was a tiresome devotee — of St. Nick. The Labrador Land Protectors presented a petition to government on May 9, 2017 calling for the appointment of an independent expert panel on the North Spur. It was signed by more than 1000 people. There has been no response. Since that time the urgency of the panel has been raised. It has been raised by new research conducted in Sweden as well as by revelations flowing from the SNC risk assessment report released by the Premier. The recently disclosed and disturbing SNC Lavalin risk assessment report of April 2013, released by the Premier on June 23, 2017, refers to the need for further geo-scientific information to guide remedial measures and assess overall safety and stability. SNC Lavalin rated the risk as “very high.” Whether Nalcor has successfully remediated these risks over the period from April 2013 to the present is as yet unknown. It will take the work of an independent expert panel to measure whether risks have been reduced or indeed whether they can be mitigated or eliminated. Even the most politically disinterested observer had to know from the minute the Deputy Minister of Health, John Abbott, uttered the word “change” in relation to the health care system that he would be forced to eat his words — by both government and union. Having gotten Nurses’ Union head Debbie Forward’s knickers in a knot, the premier’s office sent Abbott out to backtrack. Many of us have long wondered if even one senior public servant had the spine to speak truth to power, successive governments — mostly Tory — having run the province over a fiscal cliff (note the past tense). It seems there is one such person. Skunk (definition): Strong Weed. Ridiculously strong. Usually grown outdoors. It is a guaranteed f**king-up. This is the kind of weed that leaves you sitting there giggling for twenty minutes, your legs numb, your mind completely bricked, and your hands so twitchy you keep spilling the bongwater all over the floor. Another definition - only slightly different - is found on this link. Hundreds of jobs, excitement has caught. Twelve tonnes to process has been agreed. Others think the man fanatic. With less cost for mini sizes. Could he own the split franchises? Muskrat Falls is the only hydroelectric project in the world which relies on a large natural dam, underlain by sensitive glacial clays, and raising major concerns for local communities. Experts from the Geological Survey of Canada documented the extensive presence of glacial marine clays in the Lower Churchill in their testimony to the joint federal-provincial environmental panel. MUST THE PEOPLE OF HV-GB AND MUD LAKE LEARN TO LIVE IN HARM'S WAY? Dr Stig Bernander, someone I have the utmost respect for as a technical expert and as a very decent and moral man, continues to try to save us from ourselves at the North Spur. His most recent contribution - Summing Up of North Spur Stability Issues - gets right down into the weeds. He demonstrates that based on the little data that Nalcor has, something as basic as filling the reservoir may well trigger a failure of the North Spur. Fairly basic stuff to overlook or not worry about. The wise man built upon a rock, the foolish built on sand. A natural ridge with clay to impede the Churchill flow? A natural dam with quick clay - part collapsed decades ago! Such building is foolhardy, maybe doesn't need to say. If there is one topic in the whole of Muskrat that is truly clear as mud, it’s the North Spur. Equally murky is Nalcor’s plan to use this natural formation across the Churchill River as the largest dam holding back the reservoir. PlanetNL’s agenda has deliberately left this challenging topic to others, choosing instead to concentrate primarily on the financial disaster that awaits the people of this Province upon Muskrat completion in 2021. The others who have written on the North Spur are better researched on the subject and have written passionately about the North Spur on this blog and elsewhere. “Another Way Forward” is a policy document recently released by the NL Employers’ Council. It is a response by the province’s largest business organization to our desperate fiscal crisis. It purports to contain suggestions for a “better way forward” than the one released last year by the Ball Administration. High on the agenda of the Employers’ Council is a reduction in taxation on both business and individuals, cuts to government programs and services, and a reduction in public sector employment by attrition. The Mount Pearl seat, to keep it warm. Manure that clings will not alarm. And lower future heating bill. Way back in the 1980’s when I was hanging out in the Premier’s Office on the 8th floor of the Confederation Building as Senior Policy Advisor to the Premier, I noted that there was one group that everyone respected – the Legislative Drafters. As politicians with policy to implement, the Cabinet (with the help of the Cabinet Secretariat) would draft, debate, amend and finalize what they thought the proposed new Act or Regulation should do and contain. As a next step, the measure was put into the hands of the Legislative Drafters, as specialized a group of legally trained professionals as you will find. JAMES MCLEOD IS LEAVING. TIME TO LAY BLAME. I had never thought James McLeod to be one of the four horsemen of the apocalypse. In last Saturday’s Telegram, he telegraphed just that. In mortal terror, he’s leaving the province. And I know I’m the one responsible. McLeod had interviewed Uncle Gnarley for a story in September that he called “Meet Uncle Gnarley: Muskrat Falls’ prolific doomsayer blogs in turbulent times”. I had no idea that, after just a few hours with him, McLeod would want to ‘cut and run’ — hightail it — for the mainland! Uncle Gnarley suggested readers be given a respite from the gloomy Muskrat analysis series and instead asked PlanetNL to provide a critique on a different energy concern: the impact of low reservoir levels on this winter’s energy supply needs, as just revealed in a recent NL Hydro report. The first concern is the cost of unplanned high fuel consumption at Holyrood and the standby combustion turbines over the winter and possibly well into 2018, a cost that NL Hydro is certain to want to recover through rate adjustments. A considerable pre-Muskrat rate hike will result. BARD OF PYNN'S BROOK TACKLES "MR. BIG"
“Develop or Perish!” - Smallwood. A former ‘Main Man’ steering ship? Cash for Provincial coffers fill! Energy, and fish - all travesty! Old projects, each in turn. And perished public more bereft. When entrails stirred of Muskrat beast. Did ‘Canada’ steer the scam? Perchance a numbers game afoot. Is there ‘The Man’ for subterfuges? (The latter crowds only stooges). To move and shake the political air. A puppet-master behind the scene? Mercifully, Finance Minister Tom Osborne kept the Budget Update short. It won’t get much ink here, either. Osborne has confirmed what most people seem to have concluded: he has no intention of tackling the deficit. The former Finance Minister, Cathy Bennett, told a reporter that “I wish we had had better information going into the election campaign,” seemingly ignorant of the fact that, as an MHA, she was always expected to read — and to understand — the Budget Estimates. Of course, her search was for a scapegoat. Osborne, not four months into the job, hopes he has found one too. Previous PlanetNL instalments have detailed how the uneconomic Muskrat project threatens to destroy NL Hydro and ratepayers or, if the subsidy route is chosen, Government and taxpayers. The painful third alternative is to choose to stop the project and have the Premier call on Ottawa to act fully and promptly on the murky Federal Loan Guarantees of $7.9B. Even with the federally guaranteed debt removed, serious issues remain. Ratepayers still face large rate increases and the Provincial Government must record a total loss of equity. Emera would suffer contractual losses and demand compensation. Ottawa would be divided on whether to act as many other provinces will not support the bailout. A substantial and raucous debate is sure to erupt whenever Ottawa publicly considers this request. The Uncle Gnarley Blog stands by the source who provided information regarding the welding defects Nalcor has encountered on the Labrador-Island Transmission Link (LIL). The existence of the defects has now been confirmed by a second source. The blog post entitled Faulty Towers: Nalcor's Comedy (Of Errors), published on Monday, reported that the problem is associated with the welds on a component part located at the base of each tower. Newfoundland would have provided the perfect setting for the British TV Comedy series “Fawlty Towers”. Here, John Cleese would have had no need for inventive double entendres. And the laughs could have been on Nalcor’s dime. According to an Uncle Gnarley Blog source, Nalcor is grappling with a new problem. And it is no laughing matter. As you might have guessed, the issue revolves around faulty towers. Nalcor has discovered structural defects in an undetermined number of the towers on the 1100 km Labrador-Island Link (LIL). That’s the extension cord intended to deliver Upper Churchill recall power next year and, subsequently, power from the Muskrat Falls project. According to the source, the structural integrity of a selection of 30 towers was tested recently. The tests produced a failure rate of 100%. IS MUSKRAT FALLS A PONZI SCHEME? There are remarkable similarities between the business model for Muskrat Falls and a Ponzi scheme, credited to Charles Ponzi, who instigated the first Ponzi scheme in 1919. Bernard Madoff was one of many who built upon the original Ponzi concept. Madoff met his Waterloo in March 2009, when he pleaded guilty to 11 federal felonies, including securities fraud, wire fraud, mail fraud, money laundering, making false statements, perjury, theft from an employee benefit plan, and making false filings with the SEC. Will Muskrat Falls lead to such a wide range of criminal charges after the Commission of Inquiry has concluded? The business model for Muskrat Falls is built upon fictitious energy sales which created unearned revenues. Electricity consumers were conscripted to participate in these fictitious sales through amendments to the Electrical Power Control Act which conferred monopoly power upon Nalcor, so that all large consumers of power were required to buy power generated at Muskrat Falls. IS NALCOR OK WITH THIRD WORLD HEALTH AND SAFETY PRACTICES? What was Occupational Health & Safety (OH&S) doing at the fly ash plant in Goose Bay two weeks ago? Did the Inspector order it closed, as a local source — a former worker — reports? According to the source, the plant was ordered closed but was back in operation again within a day or two. The plant is the sole supplier of fly ash to the Muskrat Falls project. The operation is housed in an old hangar near the Goose Bay Airport. The building is reportedly in poor condition and, according to the former worker, unsuitable for its current use given the toxic nature of fly ash. Fly ash is used in conjunction with (or as a partial replacement for) Portland cement to improve a particular property of concrete (e.g. to slow hardening) or to restrict a specific chemical reaction. It is a by-product of pulverized coal and this source believes that, based upon product data sheets, the ash contains a high percentage of silica. Terry Paddon, the province’s Auditor General will be stepping down at the end of the month. His swan song was the recent release of his annual report to the House of Assembly, on the Audit of the Financial Statements of the Province of Newfoundland and Labrador, for the year ended March 31, 2017. In light of the parlous fiscal state of the Province one has to ask if he told the truth, the whole truth and nothing but the truth? Did he speak truth to power in a language that both citizens and their elected representatives can understand? In particular, how did he deal with the Muskrat Falls project? If you live in Newfoundland, you know all about wind. There’s the natural kind… and then there’s the wind that keeps carpetbaggers aloft until the easy money disappears. “If you got the juice we got the use,” Kathy Dunderdale was fond of quoting the New England Governors, the cost of producing the power never entering the equation. "Even if we produce everything we have here at Muskrat Falls and Gull Island, we still wouldn't fit all the energy demands south of the border," the CBC quoted Kirby Mercer in a story posted back in June. Mercer is the spokesperson for Beothuck Energy’s proposed wind power project in St. George’s Bay. Like Dunderdale, economics seems not to matter to him either. Not surprisingly when politicians and public servants screw up, and their error is exposed, the excuse register gets pretty crowded. That was the case when this Blog revealed that Nalcor lost $66.9 million on a hedging scheme in which it speculated on $1.82 billion of the most recent $2.9 billion Federal Loan Guarantee - funding for the Muskrat Falls project. On NTV, August 21, 2017 CEO Stan Marshall defended the loss - suggesting nothing would have been said had it been a win. Of course, Marshall was mute about Nalcor's expertise in this complex and risky field. He did not mention if he had given any guidelines (limitations) to his officials - now speculators with the public purse. Nor did he comment on whether those decisions are given over to some investment advisor with no skin in the game. And he offered no data as to the frequency of the Corporation's hedges. And, which would have been nice, he didn't confirm if – over time - wins/losses had evened out. Certainly, there was no mention of Nalcor’s $14.1 million loss (including fees) reported in its December 31, 2013 Financial Statement . The losses were recorded on nine hedge contracts worth $2 billion entered into between December 3-6, 2013. 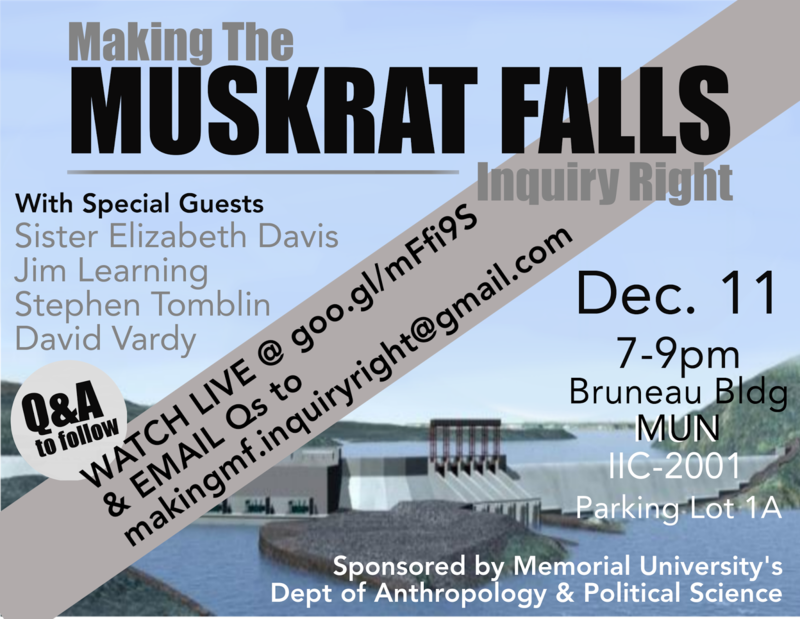 Editor's Note: When David Vardy released the essay entitled “Making Best Use of the Lower Churchill: The Muskrat Falls Development”, which he had prepared as a brief for the Action Canada Fellowship in 2011, it constituted the first sceptical appraisal of the many claims of the Williams Administration regarding the project. It took six more years before then Fortis CEO and current Nalcor CEO Stan Marshall got around to describing the project as a “boondoggle”. But Vardy was there, at the starting gate, absent any but the public interest, to warn of that likely outcome and to replace hyperbole and falsity, often issued under the guise of patriotism, with objective analysis. It can rightly be said that Vardy not just wrote the primer on the Muskrat Falls project; he was the "first responder" sounding the alarm, demanding notice of Muskrat as ill-considered, possibly injurious, public policy. In PlanetNL2, Nalcor’s 50-year Dividends forecast was assessed along with the assumed costs of the 50-year Muskrat Power Purchase Agreement (PPA). At the time, a revised Nalcor PPA cost forecast was not available, therefore some general guesstimates were made in the absence of specific numbers. The preliminary analysis predicted huge subsidy requirements from Government to mitigate Nalcor losses and bankruptcy. On October 3, 2017 Nalcor responded to a citizen’s Request For Information to issue the up-to-date forecast of PPA costs. A full analysis is presented here using Nalcor’s own exact PPA and Dividend numbers, in combination with the Premier’s expressed 17 c/KWh rate cap, and the PlanetNL prediction that energy sales will fall by 30%. The results are indeed as frightful as feared: Government debt is going to rapidly mount and crush program spending. WILL PREMIER ASSUAGE ONE PERSON'S WORRIES ABOUT PUBLIC INQUIRY? The Premier’s announcement that he will reverse course and call a public inquiry into the Muskrat Falls project has attracted much comment on this Blog and in other forums. The public’s worst fear is that the inquiry will accomplish little and result in another waste of money. Scepticism abounds that government will restrict the inquiry’s mandate. Nalcor meddling is an undercurrent of the debate. Another is that the government will placate the many politicians and restrict the inquiry from having them testify and face examination. Only the Premier can quell those fears with announcement of the broadest possible inquiry mandate. If this were a different time, we would wonder why the Premier chose a Liberal Party fundraiser to announce that he will now call a Judicial Inquiry into the Muskrat Falls project - the very people the $12.7 billion "boondoggle" will least affect. If this were a different time, we would wonder why he chose to disclose one of the most important initiatives of his Administration to this group of peddlers, contractors and compradors that hung on Danny Williams’ coattails. If this were a different time, we might ask the Premier to share his moment of conversion and what inspired him to do an about face. However, while those things niggle at our sensibilities, none constitutes the real issue. The larger object of our focus, now, must be getting the right inquiry. When government agencies engage in self-aggrandizing claims, they really should try to support them with something more than rhetoric. The public awaits PUB approval of a NL Hydro sponsored electricity rate increase of 6.6% in 2018 and another 6.4% in 2019. The PUB has adequate reason to reject at least a part of the request. A grandiose scheme, beat the gong. To let power flow To let flow to Up-along? As heat bills to the heavens sent. Rates are low, cost high-sized. To fill Brakes Cove, what's the need? To development if must proceed. Assemble mills in filled-in Bay. The public signed for cost to pay? That old hype pattern on project moot. - Demand a stop to our cash input. Guest Post by the "Anonymous Engineer"
The letter to the Editor of the Telegram and the concurrent discussion with the journalist Pam Frampton by the Consumer Advocate Dennis Browne of August 19th, 2017 was a futile exercise in public relations. Mr. Browne did not say anything that the public had not already heard from Premier Ball, Minister Coady and CEO Stan Marshall. At least there is one remarkable element of consistency – they are all singing from the same sheet of music, which no one believes. NALCOR LOSES $66.9 MILLION IN 6-DAY FAILED HEDGING SCHEME. PUBLIC NOT TOLD. Just when you thought the incompetence couldn't get any worse at Nalcor, along comes another scheme to up the ante on deceit and dumb. This blogger has just learned that Nalcor lost $66.9 million following management's decision to place a bet of $1.82 billion - public money - in the “futures” market. Nalcor even tries to put the blame on U.S. President Donald Trump. To add insult to injury, Nalcor and the Ball Government did their best to cover up the failed scheme. The losses occurred in May of this year. An eagle-eyed Nalcor watcher, able to parse Nalcor’s most opaque assertions, brought the contents of the corporation’s last quarterly financial statement to my attention. The sanctioning of the Muskrat Falls project in December of 2012 was a huge mistake, one which has spiralled into a major economic and environmental catastrophe. The warnings of the joint federal provincial panel were ignored, as were those of the Public Utilities Board. These warnings relate to the lack of a business case for the project, the high risk for a small province, the adverse demographic factors, the lack of export markets and the high unit cost. In a Telegram article dated May 25, 2013 the Honourable John Crosbie said that “Muskrat Falls is worth the risk”, quoting T. S. Eliot on the subject of risk: Only those who would risk going too far can possibly find out how far you can go. Since then we have sailed on a sea of risk and reaped the whirlwind. Only within the upside-down world of Alice would much of what is occurring in this province make any sense. Still, the behaviours of such an inverted — some would say perverted — place, their origins in the Premier’s Office, ought not to extend to our few institutions. Politics in NL has been turned upside down. An excessive level of stupidity, denial and self-interest — far more than normal — has infected our political process. That the Ball Liberals have prolonged the madness begun by the Tories does not make it any less mad. It has been allowed to run through the senior bureaucracy, too — try as the government might to create the perception of normalcy.